Today I am starting a new series of articles focusing on the Goals for Driver Education (GDE). I have been thinking about, discussing and writing about the GDE for several years. I have consciously looked at how to put it into practice during my driving lessons and described and explained it to groups of people on numerous courses. My conclusion is that there is nothing to it and, whilst I know you might be thinking, that’s easy for you to say, I will endeavour to explain why this is the case. My starting point is that there is more to driving than meets the eye. If you are of the opinion that driving is nothing more than skills acquisition and once you observe correct driving practices you have produced a driver and therefore your job is done, then you will find it difficult to get to grips with the GDE. Observable skills are like the tip of the iceberg and what is beneath the surface is unfathomable and of far greater importance than what can be seen above the surface. We know this is the case when we take our learners for test. Some are able to perform perfectly on the day and even produce clean test sheets; whilst others go completely to pieces and let their nerves take over. What causes one person to behave so differently from another when they have had the same driving instructor and even a similar number of driving lessons and the driving instructor judged that they were both ready for their test? The answer is ‘Personality’; and it is the same answer when we consider what causes one person to be involved in a crash whilst another is not. Behaviour is the product or observable outcome of personality; and wrapped up in ‘personality’ is everything that makes a person tick: beliefs, values, opinions, emotions, ambition, characteristics, experience, conditioning, etc. We cannot isolate behaviour from personality when training someone to drive safely and responsibly. We have to address the whole person. We can, however, isolate behaviour from personality when training someone to pass a driving test. This is what we do traditionally when we focus on the skills and techniques that someone needs to handle a vehicle and deal with different road, weather and traffic conditions. What happens, however, once they pass their test? We know from research conducted by Professor Steve Stradling of Napier University that they enter into the Expressive Phase of learning to drive where they drive according to their personality. This means they no longer bother with the skills and techniques they learned with their driving instructor unless these suit their needs. The result of this is that new and young licence holders are disproportionately represented in road traffic crashes. ‘Young drivers (17-24 years old) are at a much higher risk of crashing than older drivers. Drivers aged 17-19 only make up 1.5% of UK licence holders, but are involved in 12% of fatal and serious crashes . There are many reasons for the high crash involvement of young drivers. Specific risk factors and risky behaviours include over-confidence, poor assessment of hazards, prevalent risk-taking, speeding, drink and drug driving, not wearing seat belts, the use of mobile phones, carrying passengers, driving at night and driving unsafe vehicles. Attitudes to risk are not tested in the driving test. If we focus solely on the skills a new driver needs in order to handle a car when teaching them to drive, we overlook all the behaviours that are likely to get them involved in a crash post-test. This is where the GDE comes in. 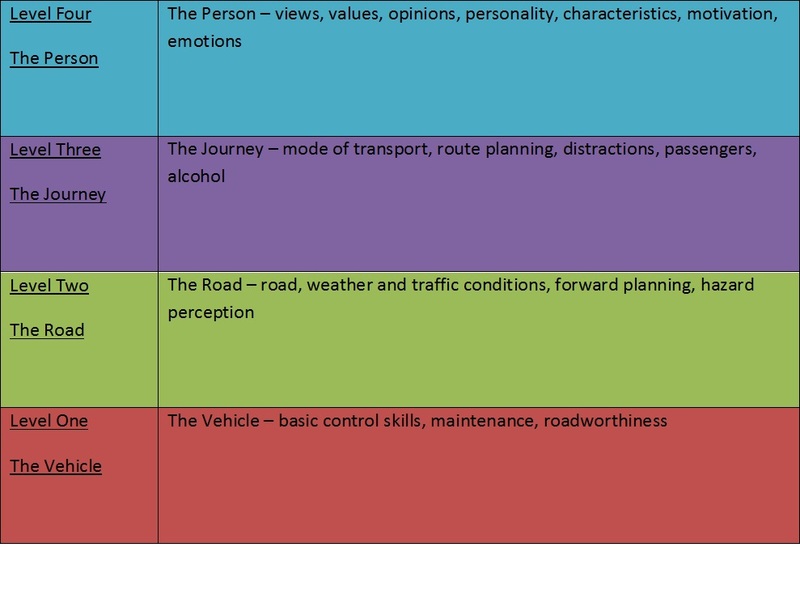 The GDE provides a big picture overview of what makes a safe and responsible driver. It says that, in order to produce a safe and responsible driver, these goals need to be addressed. 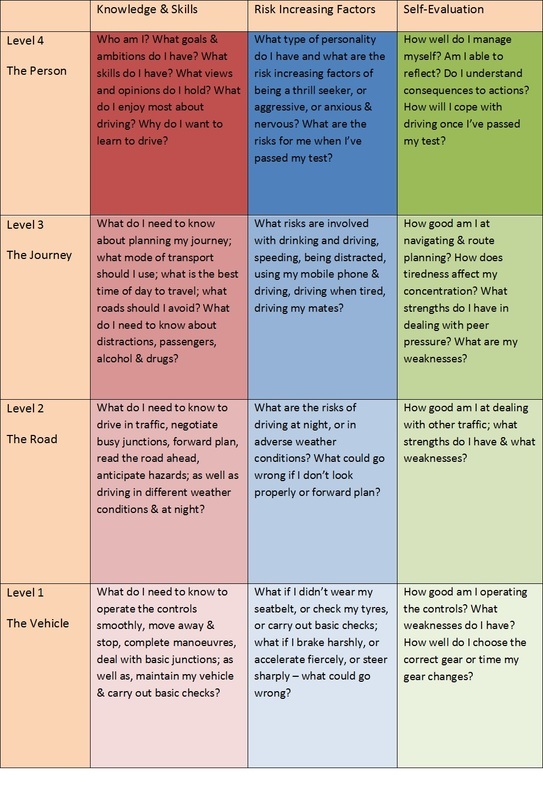 The goals are laid out in a matrix (or framework, or table) with examples within each box of the matrix of the type of things that need addressing in order to meet all the goals for educating drivers. Initially, there were four levels and three columns. More recently, a fifth level has been added, as an expansion to the fourth level. The fifth level is implicit in the fourth level anyway but some people will find it very helpful to consider a separate fifth level. I will explain this more fully in my next article. The four levels of the GDE framework run from the bottom upwards. These are just examples of the sort of things that come within each Level and are not conclusive by any means. Traditionally, only Levels 1 and 2 are covered in driver training as these goals are sufficient to develop the skills that are assessed on the Practical Driving Test. The risky behaviours displayed by those drivers involved in crashes come in Levels 3 and 4 and these are not addressed consistently pre-test. 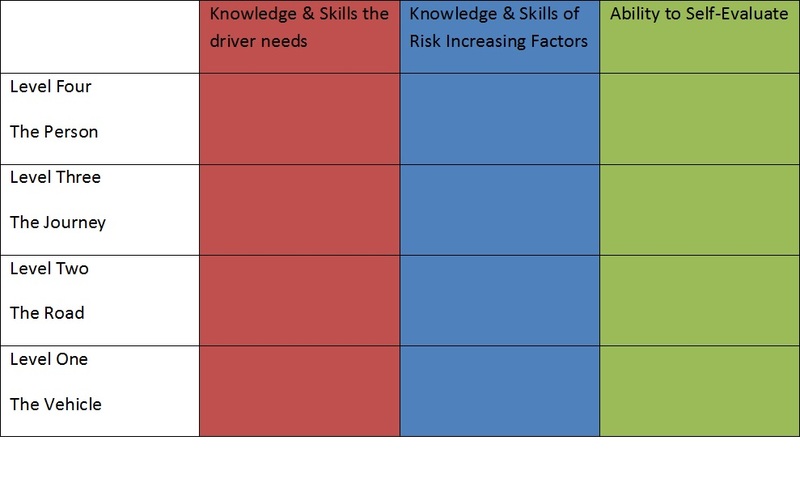 In addition to the four Levels of the GDE there are three Columns: The knowledge and skills the driver needs in order to meet the goals within levels 1, 2, 3 and 4; knowledge and skills of the risk increasing factors involved in the goals within levels 1, 2, 3 and 4; the ability to self-evaluate within each of the four levels. When all four levels and three columns are put together we end up with the Goals for Driver Education Framework (GDE) that looks like this. I’ve filled the boxes with the sort of questions drivers need to be asking themselves in order to become safe and responsible drivers. Addressing the goals for driver education will produce safer, more responsible drivers because they will have a better understanding of the sort of things that make them tick; they will know how the way they think and the way they feel affects the decisions they make; and they will have techniques to help them self-manage. There is only one way to address the goals for driver education and that is with coaching and client-centred learning techniques.